The problems with the Galaxy S10 devices may not necessarily be rooted with Sprint: S10+ users on AT&T and T-Mobile have been dealing with bad cell reception as well. However, Sprint has since stated that it has received complaints from S10e, S10, and S10+ owners — some of them have been relegated to using roaming networks while others have, at times, been at a total loss of data and/or voice services. The potential good news here is that the carrier released a software update (version ASC8) on March 27 that, it says, should fix these issues for most users who have had to deal with "intermittent" data or voice service loss. If users have the update installed, but are not able to troubleshoot their way back to full cellular reception, the devices are considered to have "permanent" service loss and will need to be exchanged — some customers have complained about the arduous process. Meanwhile, a number of Galaxy S8 and S8+ users have had problems accessing Sprint LTE after installing the Android Pie upgrade, software version DSC1. The company said on Tuesday that it has stopped rolling the OTA out and is working with Samsung to investigate the problem. The carrier cannot guarantee when it will be able to push out a patch. S8 users who would like LTE reception back will have to contact Samsung or visit a Sprint store to replace their device. Sprint may charge a replacement fee if the device is out of warranty and the customer has not bought Sprint Complete protection. That means many of these customers may have to settle for 3G and Wi-Fi for an indefinite period. We requested comment from Sprint yesterday and have yet to hear back. We scoured around to see if the Galaxy Note 8 had similar issues and found complaints on both Samsung and Sprint support forums as well as an article from Pocketables. As with the Galaxy S8 situation, users say since the Android 9 Pie update that they also have had no LTE access, just 3G. A Sprint representative stated yesterday that there should be a software update coming soon to fix the issue, but didn't say when. 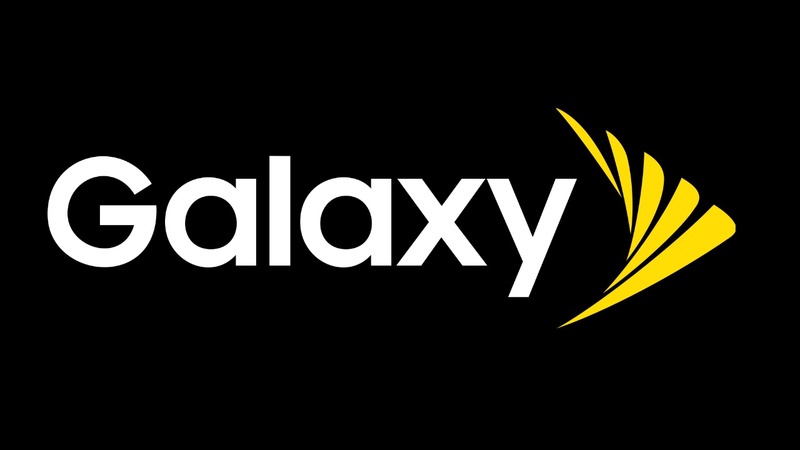 Sprint has announced it will issue another software update to fix the ongoing reception issues for the Galaxy S10e, Galaxy S10, and Galaxy S10+ starting on Tuesday. We'll gather reaction and report back later this week. The carrier also told Galaxy S8 and S8+ owners that their reception issues are based in a different root cause. A separate patch is in the works and will be coming for those devices at an unspecified date. As for the Galaxy Note 8, there has been no major update since our last word that a software update would be coming "soon." Sprint's community forums, though, have been updated continuously with members announcing that they have or will switch to another network. The new update is out for the Galaxy S10 series as promised with version name ASD5. Since its release, members of the Sprint Community have posted dozens of responses. A few have said that the update helped them while many others had no such luck. 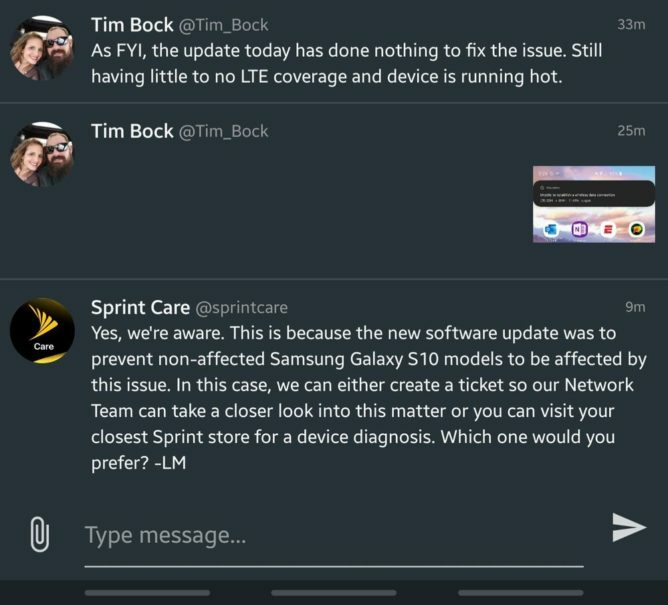 Tim Bock captured a Twitter direct message chain with @SprintCare, which told him that the update was meant to prevent phones unaffected by the reception issues from becoming affected. On the Galaxy S8 and Note 8 threads, Sprint representatives have told owners that they may yet be reimbursed for their prolonged loss of service. Bill credits are not being calculated, however, until after the reception issues have been resolved. This leaves uncertainty as to who will be eligible for a refund as well as how much that refund will be. As far as we've been able to report, neither Sprint nor Samsung have offered additional remedies beyond directing customers through standard troubleshooting and device exchange procedures.